We start 2017 with a new update from our nowcasting model for Scotland. These nowcasts relate to the last two quarters of 2016, a year which has offered plenty of economic challenges for the Scottish economy. Our nowcast for GVA growth in 2016 Q3 is 0.32% which, at an annual rate, is 1.29% (essentially unchanged from our last nowcast update). Our nowcast for GVA growth in 2016 Q4 is 0.38% which, at an annual rate, is 1.53% (this is very, very slightly up on our last nowcast update). Data published next week will be the first official figures on economic activity in Scotland in the immediate period after the Brexit vote. For comparison purposes, growth for the UK as a whole in the third quarter was recently revised up to 0.6%, partly on the back of stronger than expected consumer expenditure growth. Note, the current data show that Q1 growth in Scotland was 0.0%, and in Q2 was above expectations, coming in at 0.4%. Today (5th January) we release our latest series of nowcasts of the Scottish economy; these are our revised estimate of the growth in 2015 Q3 and our second estimates for 2015 Q4 . Our estimates for 2015 Q3 are essentially unchanged from last month, while our estimates for 2015 Q4 are being revised upwards, very slightly, as new information is being received on this quarter. Since we are now in 2016, it is perhaps worth reflecting back on the performance of the Scottish economy through 2015. The chart below shows each of our nowcasts for the four quarters of 2015 (starting with our first nowcast of Q1 released on 2nd February 2015). Recall that given the delay in the release of official estimates of Scottish GVA, we release 6 nowcasts per quarter, with the later nowcasts using the most data about that quarter, and the earliest nowcasts using the least information about that quarter (as these data are not released until during and in some cases after the quarter itself). The chart below shows a couple of very useful things. Firstly, it demonstrates exactly what we have been saying on this blog throughout 2015- the Scottish economy is performing below what one might expect given the stage of the business cycle we are at. One would expect growth above long term growth rates of circa. 2%, which we are not seeing. Secondly, it demonstrates that the more information we are receiving about the economy, i.e. as we go from nowcast 1 to nowcast 6, the lower our estimates of economic performance in Scotland become. Thirdly, in all cases, we can see a clear downward trend in the nowcast rate of growth through 2015. This is likely to be reflecting -principally- the downturn in economic activity linked to the North Sea Oil and Gas sector, where activity remains subdued due to the rapid fall in the oil price since the summer of 2014. We will add to these data with our next three nowcasts as we produce additional estimates for 2015 Q4. In terms of Q4, there are likely to be a couple of important factors which may drag growth even lower than our current estimates. Firstly, the recent closure and disruption to the Forth Road Crossing is likely to impact economic activity on the East Coast. While various numbers have been quoted in the media in recent weeks, the true impact will be reflected in the Q4 GVA estimates, official first estimates of which will be available in mid-April 2016. Secondly, performance in Q4 is to some extent dependent upon footfall in shops over the important Christmas period (itself a reflection of underlying consumer confidence), and while overall employment numbers may look good, under-employment issues persist. Looking forward to 2016, a few issues stand out. 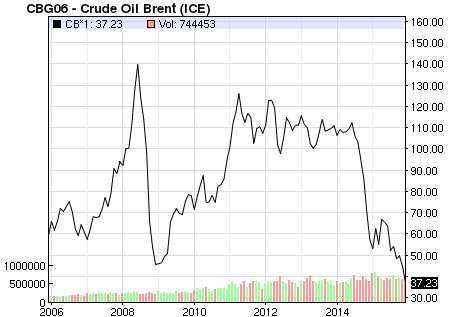 The first of these is the low oil price which is having a pronounced effect on the economy of the North East of Scotland. 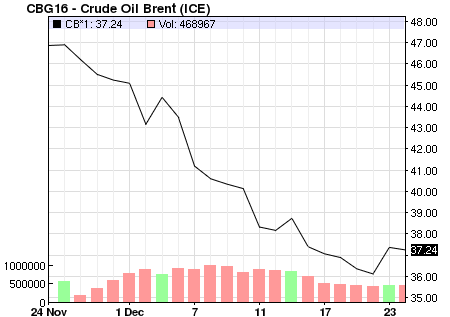 Towards the end of December Brent was trading at $36-39 (see first chart below, courtesy of Nasdaq). Similarly, the next chart (also courtesy of Nasdaq) illustrates Brent prices over the past 10 years, illustrating that Brent is now at or around its lowest price in that time period. This is not the place to engage in a debate about the nature and cause of the significant drop in the Oil price in the past year or more, nevertheless it is clear that something significant is going to be required to reverse the current low price in the Oil market. Additionally, while the Brent price is at or around levels seen towards the end of 2009, there are two important differences. The first is that forecasts of oil prices by the International Energy Agency and others generally expect that the oil price will continue around its current level through 2016. The second is that the costs of extraction activity in the UK Continental Shelf have increased over the period, placing a squeeze on the value per barrel extracted. Secondly, external demand is of central importance to an open economy like Scotland. While growth in the rest of the UK has remained reasonably strong through 2015, although recently revised down slightly, weakening of external demand is likely to be a continuing concern through 2016. The recent decision to raise the interest rates in the U.S.A. very slightly suggests some degree of confidence in the improvements in economic performance there, however continuing lacklustre growth in the Eurozone will remain a concern. Thirdly, while the most recent official estimates of GVA for Scotland (which were for Q2) were disappointing, they did suggest remarkable growth in the Construction sector. To the extent that the final two quarters of 2015 saw any weakening in construction demand, we are likely to see this translate into overall weakening of economic growth. For details of how the data mentioned above, and other “live” data on Scottish economic activity are used to construct our “nowcasts”, see the Methodology page. Note as explained in the methodological paper (here), we nowcast gross value added (GVA) rather than gross domestic product (GDP), because this is the regional equivalent of GDP which is produced, but we refer here to GDP for intuitive ease.